The following white paper was written during our second attempt to do this project for the people of Sonoma County, California following their massive 2017 wildfires. RVs Without Borders advocates a simple post-disaster transitional housing model based on 1) crowd sourcing under-utilized privately-owned RVs, 2) matching RVs with those who lost homes on a needs basis, and 3) connecting the matched RVs/displaced residents with home hosts as close as possible their former home. Our goal is to prevent the terrible costs communities face after a disaster, when those who lost homes move away and depopulation tears apart schools, local services, and businesses. If I feel this way maybe other RV owners will too? Within 4 days, the first RVs Without Borders house trailer was handed off to a fire victim in Middletown, who was promptly rousted by a Sheriff’s patrol and told to leave! While making more RV/client matches over the next several months, we learned many important lessons about what will and won’t work in the physical world and the political, including other ways communities can increase their disaster response resilience. County officials learned alot too. In response to the 2017 fires, local officials are far more prepared to proactively integrate RVs in their recovery plans. In fact, the Sonoma County planning department reached out to us 5 days after this fire started and asked if we would try to offer our solution to the residents here. RVs Without Borders has significantly honed its service model to attract more RVs by resolving legal/insurance risks and uncertainties involved in lending RVs as a charitable act. As we re-launch RVs Without Borders version 2.0, we hope we are advancing towards a scalable solution and welcome ideas or assistance no matter how unconventional. In a tight housing market without much vacancy, the only sheltering solution that can possibly arrive fast enough to clear out relief shelters without depopulating the area is RVs – “little homes that roll”. Nothing else comes close in deployment speed, quality of living, ease of utility provisioning, user familiarity, legal practicality, or cost of use. With 9 million RVs in the US and most in storage at any given time, just 1% of our nation’s RV army could shelter nearly all the nation’s disaster victims each year – if only the RVs could be deployed efficiently, such as the manner AirBnB deployed unused bedrooms and then vacation homes. Katrina proved that the government can’t do this, but we think America can! We invite mass deployment, from loaning out unused RVs at charitable rates to permanent donations. To overcome legal uncertainties of lending RVs as a charitable act, we now facilitate loaned RVS with mandatory vehicle & liability insurance to protect the RV owner and RV user. We invite RV owners to set their own charitable rental rate, enabling them to cover their expected wear & tear costs or give the equivalent of a gift at $1/day. If RVs are safe and comfortable enough for wealthy retirees to vacation with or live in full-time, they are safe and comfortable enough for someone who just lost everything to live in until a more permanent home can be had – especially when the only alternative is leaving their community. Today’s disaster survivors don’t get that choice and we aim to provide it. Nearly any undamaged home in the damage affected area is an enormous asset to economic recovery. By home hosting an RV for a displaced neighbor, this temporary housing unit can be connected to an electric outlet, water hose bib and use a plumbing clean our or pump service contracted. No permits should be needed for “X” months post-disaster, since RVs connect like this routinely without permits. Home-hosting directly connects every family in an RV to a family in a house, making the RV occupants a known entity for the neighbors to support, not reject. These one-to-one personal connections can maintain and enrich neighborhoods one RV at a time, one host at a time, without any of the risks inherent with RV encampments. 6) Advocacy: Temporary Guest Homes On Wheels Work! We advocate our “RVs temporary guest homes” with local governments. We invite local governments to collaborate with us to make this possible. We challenge them to learn together and find better ways to make our communities more resilient. The conventional alternative of group RV encampments is time consuming and capital intensive. It requires vetting land for suitability, building utility infrastructure as well as managing the security and liability risks inherent with this housing model. A charitable rate RV is a solution that works rapidly and can be a temporary solution until more housing stock in built to replace the housing structures lost. It’s so simple for all parties these days that it is really irrational to ignore this opportunity. 7) Innovative Gifting: This Is Our Gift; What Is Yours? We are volunteers seeking better ways to match owners of under-utilized RV assets with those who just lost homes, and to find sensible locations for parking them that maintain community. If you can help with an RV, a location, filling an RV with supplies for those who will live in it, volunteering to help us do more of this, or a better way to do it please contact us! We also accept permanent donations of “90 or newer” RVs in good livable condition, and can arrange 501(c)(3) charitable deduction letters. Other RV donation services just auction your old RV – we turn it into an opportunity for the donor to directly connect with a family whose lives you transform. Our needs-based model reserves permanent donation RVs for uninsured clients with strong local ties such as students in school, who need both a home and an initial financial asset to begin recovery. 9) Community, Not Cash: Have You Noticed We Aren’t Raising Money? Money gets messy, and if we received any the first pile would go to lawyers and accountants. Instead we are trying to create a modern “barn raising” model that enables post-disaster local community resilience through directly connecting people, without the need for us to spend much money nor raise it. Maybe it will work or maybe we’ll need money sometime. Either way, the casework is time consuming so we do need volunteers to help us attack this big problem in a way meant to be “by the community, of the community, and for the community”. 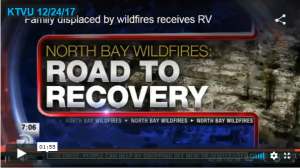 If participating in helping people isn’t reason enough to support our effort with your RV, utility hookups, time, or expertise, then you might check the weather: with so many natural disasters of all kinds becoming the norm these days, none of us can ever know if we will be the next family that needs RVs Without Borders…thank you!